The difference is that if you failed to choose a desired apartment, you are able to sell it and take back at least some money. Unfortunately, it will never work with a CRM system. Given time is money, the cost of a wrong choice increases even more. Surely, the more often we change apartments, the more experienced we become and fewer mistakes we make. This article is for those who do not have extra time and money on costly experiments and who understand that relying solely on advertising is a dead-end road. Knowing the features of various CRM systems and comprehending their strengths and weaknesses are necessary but totally insufficient criteria for choosing the right CRM system. The article contains hands-on recommendations, as well as an approximate timing and cost estimates of the preparatory works for implementation. Thus the keen reader could, if necessary, define a scope of works and budget in order to choose the right CRM system. As the well-known statement goes: “The end justifies the means” one should answer the question: “Why do we need it?” before choosing a CRM system. Though the answer may seem simple and obvious, it’s quite strenuous to give one regarding an individual company’s requirements. 1. What do we mean by “us”? Since the question is why we need it one should know the answer to it not to confuse the expectations of business owner with those of the Head of Marketing. Otherwise we lose our time and money irrevocably. Moreover, talking about the cost, we should understand who will sponsor the CRM system implementation project. 2. Is it really what we need? Perhaps we chase after different goal but unconsciously misunderstand the concepts? For example, any businessman would say that “To increase the company’s profit” and ”To ensure customer base retention or expansion” are far from being identical objectives. Both customer base retention and expansion do not always result in profit increase. Speaking about retention and expansion, we usually mean the profit increase. It works for the long term, but for the short term, it can be exactly the opposite. 3. How will we evaluate the progress of achieving the goal? After all, if we intend to control and manage it, we should understand how to measure the results. The more specific and precise the goal is, the simpler will be the choice of tools to reach it, especially when it comes to pricing. Usually, if you don’t know the answer to this question you have no answer to the previous one. 4. What is your timeframe for reaching the goal? After all, the saying “A stitch in time saves nine” is frequently mentioned in business. In my experience the search of an answer to the question ” Why do we need it?” in accordance with the above mentioned recommendations takes from a week to six months, but the average is 2 weeks or two-six hours with the consultant (if you involve business consultants who are really good at negotiating with the executive management). Having answers to these questions we are able to move on to the next step in choosing a CRM system. Is there any need in CRM system at all? Make sure that CRM system will help you reach your objectives. There should be other ways to achieve your goal without any system implementation. How can you do this? You just need to be honest defining the obstacles that prevent you from achieving the goal now. • write down 5-7 most urgent business issues and try to find out why they arise in your company. • apply this procedure to the defined issues until you have found the root causes or these causes are out of your competence so the further research makes no sense. The example of such a consideration tree is given below. The top issues are highlighted in red. If you follow these tips you will soon have a visual picture, revealing the obstacles on your way to success. If you find it difficult to make such analysis yourself, get a consultant, experienced in the Theory of Constraints to help you define your goal and analyze current obstacles that prevent you from achieving it. If you decide to build up a tree of considerations yourself, it can take you hours on end (due to the lack of time, various distractions and etc.). If you analyze your own business with the assistance of a consultant, the analysis will take no more than two or three weeks. With such a “tree” you can answer the question: what negative effects we are expecting or going to eliminate with a CRM system implementation. The answer to the above mentioned question will help you understand what ROI to expect, when implementing a CRM system, and what kind of a team you need. Knowledge of your business and the awareness of all the negative effects will help you estimate the economic effect of their elimination. If you are unable to measure the monetary value you get after eliminating the effects, it’s likely you’ve made mistakes at the previous stages, thus moving forward is not recommended. The best option is to go back and repeat the procedure again. If the previous stages have been successful, in 3-6 weeks you will know the economic effect (let call it “S”) that CRM system can bring you within first 12-24 months after its implementation. This amount «S», approved by the project sponsor is the starting point in determining the acceptable project budget. • The initial estimates are made under the conditions of a significant uncertainty that affects their accuracy. • Business is growing, that’s why the preparation for the project and implementation are characterized by a significant number of changes that influence the timing and the total cost of the project. Consequently, it goes without saying that it is quite possible your project exceeds the initial agreed budget, however hard you may try to restrict your supplier with the agreement terms. To avoid the situation in which you lack the budget to finance the unexpected but important tasks, the initial budget for the project must constitute 50-70% of the «S», and 30-50% should be in the reserve fund, available to the project manager. Recommendations on the reserve ratio choice are rather simple. The larger the project is, the closer this ratio should be to 50%. Projects with the budget up to 20 thousand dollars – are small-scale projects, more than 250 thousand – are the big ones. In my opinion, this ratio for middle-sized projects, which constitute the majority, should equal 35-40%. Thus, 60-65% of the «S» is the amount that should meet the initial estimates of the project budget. It’s impossible to imagine a CRM system without a team that will implement it. So it’s a high time we defined the requirements for the future solution provider. As well as any other information systems, CRM systems are just a sophisticated tool, turning into a real gem in the capable hands. However in the hands of an inexperienced provider it will not bring the desired results. The tree of negative effects will help us make the right choice both of a tool and of a provider. The main recommendation when dealing with a CRM provider is the following: you should only say WHAT to do, not HOW to do. 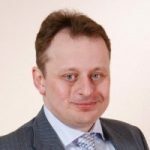 As to the CRM system implementation in order to compare the key figures “price/project quality” rather than “price/system features” let solution providers show how to use their tools to solve our unique tasks. Make a list of essential questions to be discussed with a potential provider. For example, “Show how your system can solve the issue + the description of a negative effect.” This will provide you with the necessary information and allow you to see the different approaches to solving the same issue. Before we meet with the suppliers, we should see what inner resources/competencies we have and what resources on the side of the supplier we will need to start the project. • Irrelevant policies, principles, current practices – CRM implementation isn’t enough to eliminate the existing negative effect; we should change regulations and/or people’s perception, as well as to develop procedures which will enable control over these changes. To eliminate these negative effects we need to hire a consultant, capable of analyzing the existing procedures and suggesting modification options. It’s highly recommended to involve an executive to take care of this process, as staff resistance is a normal response to changes. If the executives are not ready to back up changes, do not specify it as a task within CRM project. Members of the implementation team – business consultant, processes optimization consultant. • Or/and integrating information systems. This will free you up from necessity of multiple entering of the same data. Choosing a CRM system and its provider you will have a chance to evaluate the possibility of integration. • And/or develop incentive programs for data input. Consultants can share the experience and knowledge “how it worked in other companies” and help prepare a regulatory framework, but all this can be put into practice only if the executives show the intention to do it. • Knowledge and skills of staff – CRM systems help reduce the risks of staff incompetence only in case when employees do same work and follow standard behavioral model. The CRM system will work efficiently only if employees are trained and acquire new knowledge and skills along with a solution implementation. So if you are eager to fulfill a successful CRM system implementation and eliminate such a negative effect, make sure the expenses on staff training and new training materials/curriculum development are budgeted. IMPORTANT! The larger your company or the more intense staff turnover is, the more attention you should pay to training courses, including distance learning. It is important that these courses give a comprehensive picture of the processes for which the CRM system is used rather than show system features as such. • Undoubtedly CRM system will be extremely useful in case of insufficient routine work automation. To efficiently automate this area, one should first examine its specifics, determine the processes that can be automated, determine the necessary and sufficient conditions for the automation and outline automation requirements. These kinds of tasks are performed by analysts. The analyst is required to have at least 2-3 years of experience, whose key responsibility is to observe, ask questions and organize information. Step 5. WHO WILL GUIDE THE IMPLEMENTATION PROCESS? The thing that can’t be omitted is to find a person who will coordinate the works, control project risks and report the sponsor on the project status on time (i.e., to take on the project manager role). The larger the project is the more attention to this issue should be paid. In other words the more large-scale implementation project is the greater the need in finding professional services is. If there is no such a professional within the company who has experience in projects implementation and who is unable to constantly analyze the status of the project and coordinate the project works, it is better to outsource this task to an external service provider, or you might fail. Having all the necessary information for choosing the right CRM system we can now prepare a set of questions for the future solution suppliers. • How a provider is going to carry out the task? • What should be provided on the customer side? • What are the technical and methodical aspects of a solution? • What is the realization budget? • Can the supplier provide the references, proving his expertise? • What are the structure and the sequence of project works? • What is the project timeframe? • Who will be involved on the supplier’s side (the category of the specialists)? 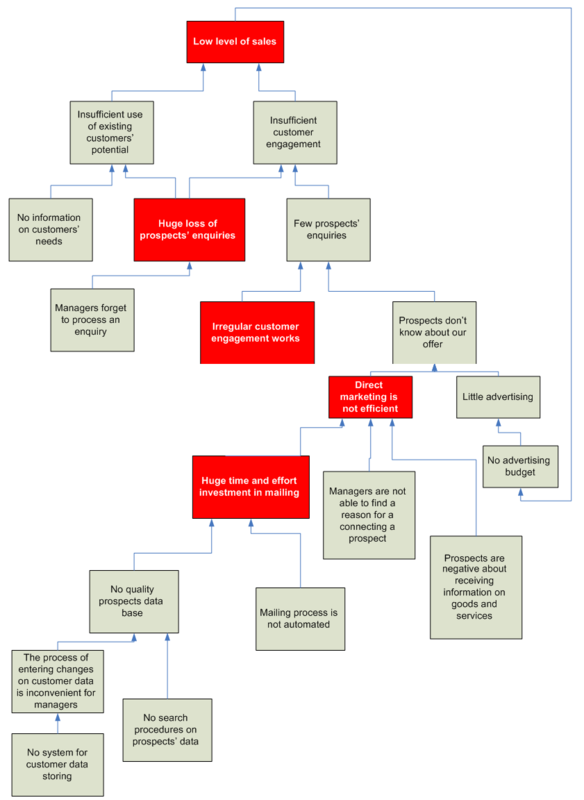 • Whom and at what stages of the project should a Customer involve? • How to manage the data transfer and ensure the cleaning of the inherited data? • What is the budget of these works? • Which training materials are delivered during the project? • Is it possible to design distance training for staff and, if so, how much will it cost? • How will the training be conducted? • What is the budget for staff training? 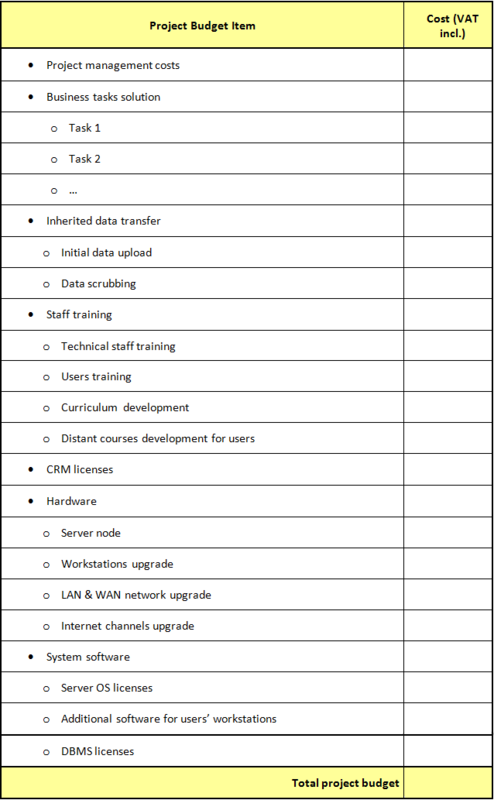 • How will a provider serve your needs after the implementation is completed? • How much does it cost to make system modifications? • Who will modify the system apart from a provider and on what conditions? • Who can confirm that a supplier provides quality services? • How to upgrade the system to the latest version? • How to transfer the functionality, tailored to the customer’s needs, to the latest version? • What actions and costs are required to increase the number of users by 2, 5 times? • What are the maintenance terms of the emergency consequences elimination (e.g. hard disk failure or destruction)? 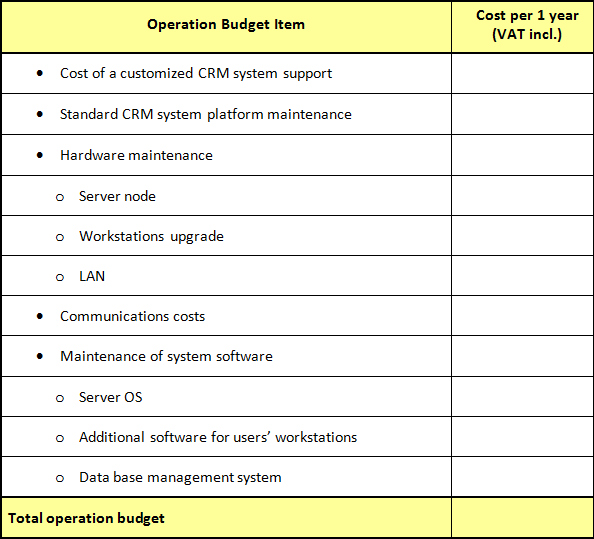 The cost of CRM system licenses, taking only 20-30% of the total project budget, shouldn’t come as a surprise. The larger the project, the lower the specific weight of the CRM licenses cost within the overall project budget. Having received and ranked the answers to the given questions and having estimated the project budget, you will be able to draw up an integrated assessment of the project “price/quality”, both at the stage of the project launch, and for the expected service life, which usually counts 5-7 years. The final advice on the negotiations with potential suppliers: the perfect number of potential suppliers should range from 3 to 5. If this number is smaller, you risk losing a good offer out of sight, and if this number is bigger you won’t be able to evaluate the pros and cons of cooperation with a particular supplier. It is possible that having negotiated with potential suppliers you will realize that you can’t get desired CRM system due to the budget or technology limitations. Don’t get disappointed; find it out before you waste your time and money. In such a situation, you can either put off the CRM system implementation for the best of times or review your requirements, getting back to the relevant stage of the preparation process. As a rule, the recurring preparation process of choosing the CRM system takes no more than 1-3 weeks. Implementors are guilty as they want to win the work so bid low and then rush through the business design phase to hit budget. The client is often an innocent bystander though all this and fail to ask the right questions.